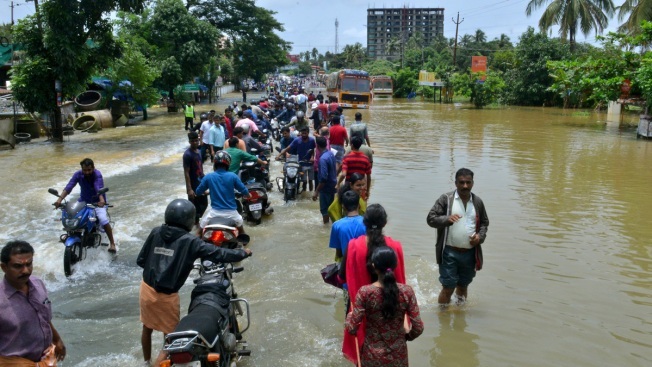 People move past a flooded road in Thrissur, in the southern Indian state of Kerala, Friday, Aug. 17, 2018. Rescuers used helicopters and boats on Friday to evacuate thousands of people stranded on their rooftops following unprecedented flooding in the southern Indian state of Kerala that left more than 100 dead. Some 800,000 people have been displaced and over 350 have died in the worst flooding in a century in southern India's Kerala state, officials said Sunday, as rescuers searched for people stranded in the worst-affected areas.